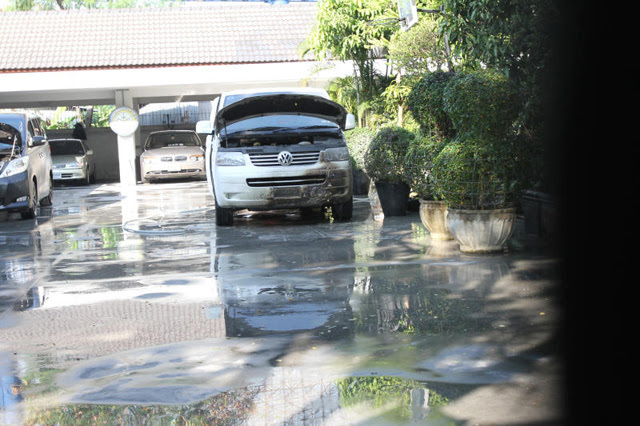 Image: Damage done by a firebombing of protest leader Chitpas Bhirombhakdi family's home. No injuries were reported. It is interesting that in 2010 I sensed that some of the media was somehow bought off or seduced by the violent protesters and their leader. Some of the strongest evidence was indirect. When I wrote words that did not match the narrative (such as that bullets were coming from the red shirt camp and the Royal Thai Army was showing immense discipline), some journalists openly attacked me, not my work. When journalists resort to ad hominem attacks, that is a bad sign. This was not true of all journalists. Many did fine work, but there was a powerful undercurrent of mob journalism and many were afraid to break from the narrative. It appears now, with a firebombing of a protest leader's house, gone completely uncondemned by the regime's propaganda front, that verbal abuse has turned into physical abuse, with the former serving as "justification" for the latter. Other incidents this week included the regime's "red shirts" threatening teachers and parents who voiced opposition to the regime. 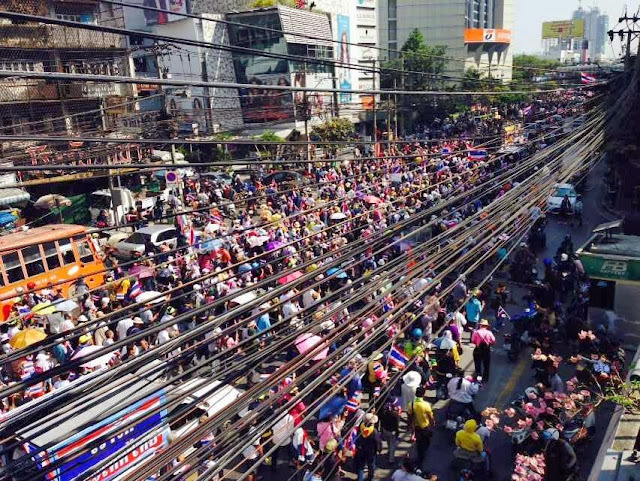 Regime thugs gathered outside Regina Coeli College in the northern city of Chiang Mai, the epicenter of some of the most notorious pro-regime violence, in a show of political intimidation, and intolerance. The bizarre, violent, and nepotist demands made by the "Rak Chiang Mai 51" group, notorious for violently disrupting an anti-HIV/AIDS parade, hacking to death an elderly man outside his own home, and hitting a female lecturer after the group attempted to disrupt a university reunion, have added to the growing climate of fear and intimidation used by the regime while it attempts to cling to power. Image: Today, thousands of anti-regime protesters take to the streets in the first of two "warm up" rallies ahead of this Sunday's main, mass mobilization. 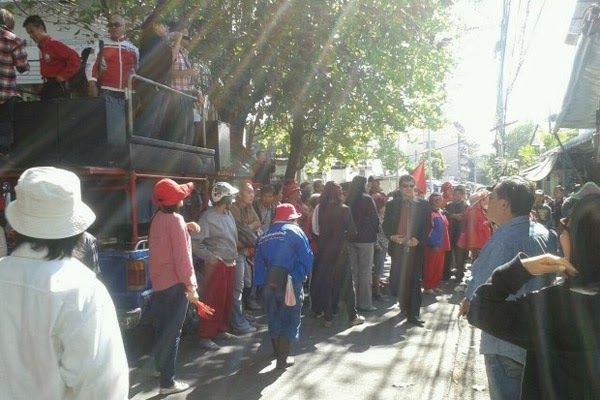 Meanwhile, undeterred, anti-regime protesters took to the streets by the thousands today in the first of two "warm up" rallies ahead of a third mass mobilization this Sunday, December 22, 2013. Two previous mass marches in November and December have dwarfed even the largest pro-regime rallies held at the very height of its popularity and power years ago.